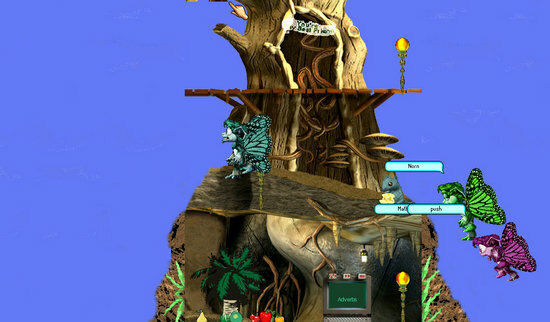 Flying Wonderland is a bright, warm world for Creatures 2. It has no radioactivity and was made for flying creatures, with modified graphics from the Original C2 Albia, divided into eighteen new rooms. NornenMeister released this world in May, 17th, 2006. The world consists mainly of a cloudless sky. In the middle of the world there is a gigantic mountain on which a tree stands. In this tree you can hatch your flying Norns. Flying Wonderland is a world without Ettins and Grendels. A winged Ettin and a winged Grendel race were, however, made for this world: the Winged Worker Ettins and the Winged Bulbous Grendels. Flying Wonderland also runs under The Albian Years. This page was last modified on 17 August 2017, at 12:58.